Photo by Rebekah Zimmerman Watts. Note that some of thee links in this post are affiliate links. Pasta is a go-to weeknight meal for so many people and for good reason! It's quick, affordable, and easy to customize. I adore real, fresh Italian-style pasta (umm hello honeymoon in Italy) but for an everyday meal at home, I almost never use white pasta. I want something that spikes my blood sugar less and digests more slowly. Sometime's it's just nice to mix it up too! So today I'm sharing my 4 favorite pasta substitutes (including my go-to brands) if you are looking to vary up your weeknight pasta rotation. What It Is: Legume pastas burst on the scene a few years ago and Tolerant brand is by far my favorite in terms of taste, texture, quality. At 21g of protein per serving, it's perfect for balanced plant-based meal, plus you get almost half of your daily fiber intake from one serving as well. This pasta is made from 100% lentil flour, but there are other varieties like black bean, chickpea, and green lentil out there. Alia's Tips: It is pretty pricey ($8+ a box), but you really need to think of it as a substitute for the protein in the meal not just a pasta. Be sure to cook it fully and rinse in a colander after cooking to get rid of excess starch that might make your final dish too cloudy or beany. It's slightly sweeter than white pasta but I love the taste and texture. If you are looking for a lower price point, some brands cut the lentil flour with other flours like quinoa, but for a 100% lentil pasta, this one is the bomb. I prefer the fusili shape because it holds together well without getting gummy or tough. Recipe to Try: These should work in almost any pasta recipe! You can try it in my Black Bean Pasta with Corn and Kale. What It Is: A simple gluten-free pasta substitute that is the closest thing to mimicking the real deal that I've found. Jovial uses brown rice flour and water as the only two ingredients, whereas many gluten-free products contain a whole host of additives and starches to hold them together. Brown rice isn't necessarily more nutritious than wheat (in fact, it has less protein and fiber than whole wheat), but this product is a godsend for those that are allergic or intolerant to gluten or find it inflammatory or irritating. Alia's Tips: Cook rice pasta a little beyond al dente. If you drain it too early, you'll find that you don't get that nice pasta bite but instead will get a gummy, chewy mess. Jovial holds up well to cooking but I'd err on the side of overcooking versus undercooking if you have to make a judgement call. Like the lentil pasta, I like the fusili shape. Gluten-free pastas have to rely on starch to hold them together and it's not nearly as strong a binder as gluten. So long noodles or complicated shapes tend to break apart or cook unevenly. Fusili and the smaller shapes hold up really well though. Recipe to Try: I toss these into soups and traditional pasta dishes but they also make a great base for pasta salad like my Spinach Walnut Pasta Salad. What It Is: Spiralized Vegetables can be bought at the store prepared (see photo above) or made at home using a spiralizer tool. But not all veggies make great noodles and I'm not a fan of the most popular spiralized veggie: zucchini noodles! 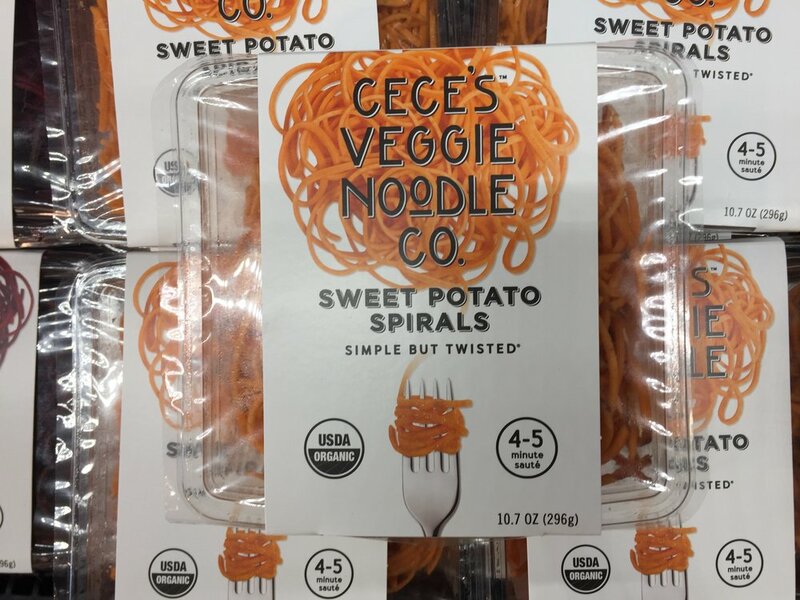 In my opinion sweet potatoes make the best veggie noodle, so I'm giving the award to them. They are firm, cook quickly, but don't turn into mushy soup and you can combine them with Asian flavors really easy to do all kinds of stir-fried "noodle" dishes. Recipe to Try: An easy, one pan stirfry dish like my Sweet potato Noodles with Chickpeas and Greens. What It Is: Lotus Foods makes these ramen noodles out of rice instead of wheat. I love the colors from the light green jade rice noodles (my fave) to the black rice forbidden noodles. They cook really quickly in about 2-3 minutes in boiling water. They come in cakes just like the instant wheat ramen that you are used to and about 1 cake is a good serving size. Alia's Tips: If you make a big pot of ramen and have leftovers, be sure to store the noodles separately from the broth. Otherwise your noodles will start to breakdown in the broth, leaving you with mushy noodles and cloudy broth. Lotus foods also makes pad thai-style noodles from the black rice and jade rice if you are looking for a different color splash on that dish as well. Recipe to Try: My Instant Ramen Jars with Miso and Veggies of course! You can also add these to any kind of soup to make it more filling. Did I miss any of your favorite alternative pastas? Let me know in the comments.